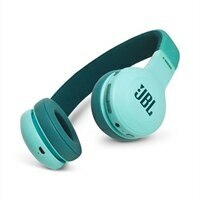 JBL E45BT on-ear wireless headphones bring the signature sound of JBL right to your ears. The E45BT is one of the most versatile products ever, featuring a long battery life, an innovative, stylish fabric headband and ergonomic on-ear design. This means that your entertainment continues and your fun factor gets amped up no matter what you're doing - working, commuting, or just making your way around town. You can seamlessly switch from music on your portable device to a ring from your phone, for example, so that you never miss a call. With a sleek appearance, various colors and the added convenience of a detachable cable with remote and microphone, you'll never want to be without your E45BT headphones. They'll cheer up your day with color and fun.